We know what you’re thinking. “Charcoal for my face?” But hear us out. This stuff is incredible for your pores. 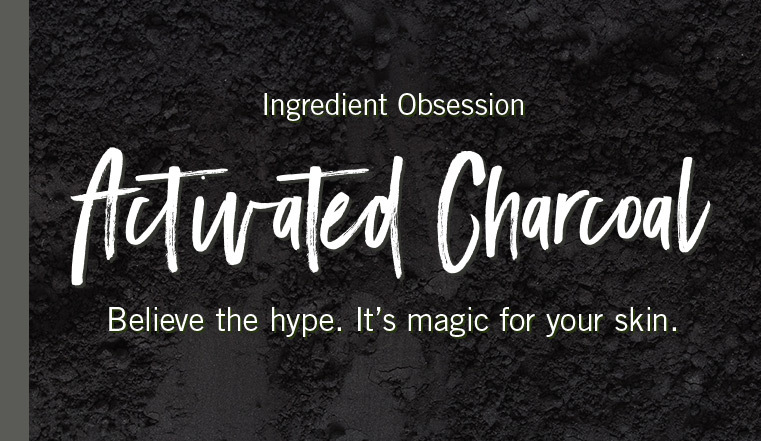 Not to be confused with the BBQ kind, activated charcoal is charcoal that’s been treated with oxygen at extremely high temperatures (over 1,600 degrees F). This process makes activated charcoal super absorbent, like a magnet for toxins and pollutants in your skin. (Fun fact: It can absorb thousands of times its own weight.) That’s why you’ll find activated charcoal in everything from face masks to body washes. And while it’s one of the hottest trends in beauty, it’s first reported uses were back in the 19th century. The Egyptians swore by its medicinal properties. WHAT ARE THE ACTIVATED CHARCOAL BENEFITS FOR SKIN? Here’s why activated charcoal is a must in your weekly skin care routine. It unclogs pores. Activated charcoal clings to dirt and impurities that build up in your pores – even ones you can’t see. We love it in our activated charcoal face mask, which lifts bad stuff from skin, paving way for a radiant complexion. It really gets you glowing. A powerful (and gentle!) exfoliator, activated charcoal sloughs off buildup and dead cells from skin. The result? Gorgeous, smooth skin. Yeah, you’re going to want to work our activated charcoal body scrub into your twice-a-week exfoliation routine. It’s anti-acne. Full disclosure: It depends on your skin and the severity of the acne. But activated charcoal has been shown to reduce acne and also prevent it. How? By removing bacteria and all the unwanted guests that cause breakouts. It’s a cut above. Antibacterial and anti-inflammatory, activated charcoal is a great topical treatment for minor cuts and scrapes.